If you travel solo a lot, the Cooluli mini cooler is perfect for your needs. It looks like a miniature fridge complete with a divider shelf to maximize the little available space. It fits six 12oz cans or four 16oz bottles. Unfortunately, it’s a smidge too short to fit a normal 500ml water bottle with the shelf removed. The cooler runs on thermoelectric technology, meaning it uses very little power. In fact, you can power it using the included USB cable. You can also plug it into your car’s 12V socket or your home’s AC outlet. Read on for our full review of the Cooluli personal electric cooler. If a bigger cooler would be more practical for your needs, see our reviews of the best 12V/24V electric coolers for other options. If you didn’t know any better, you’d think it’s a toy mini-fridge. It’s super compact, measuring less than a foot high and just over 7” wide. It’s also very light, weighing just 4 lbs. If you love traveling light, this is the perfect cooler. 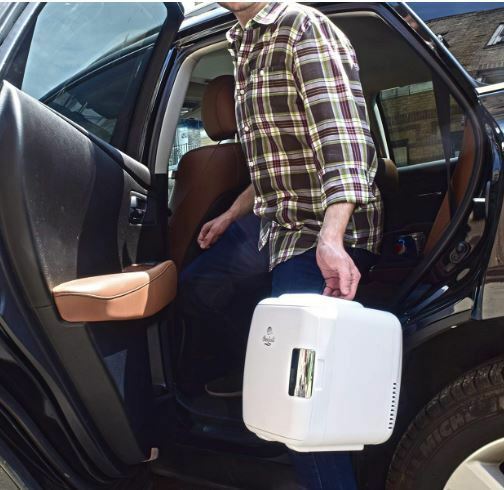 Unlike most portable coolers that are just good for camping and road trips, you can even go hiking with the Cooluli mini fridge while powering it with a power bank or solar panel. You can put it anywhere in the car, on your nightstand, on your office desk or on a shelf. Don’t let the name ‘mini-fridge’ fool you. 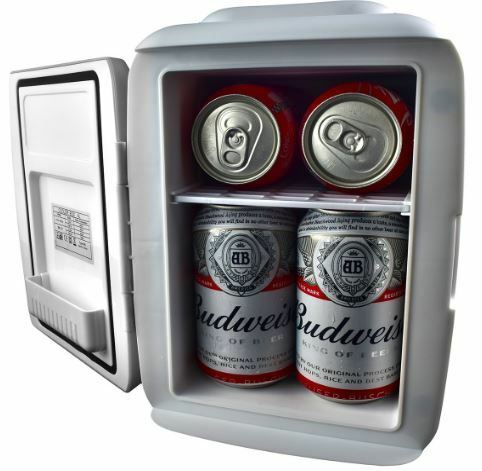 The Cooluli is very different from your kitchen fridge or even an actual portable mini-fridge. The Cooluli cooler works via thermoelectric technology rather than a compressor. 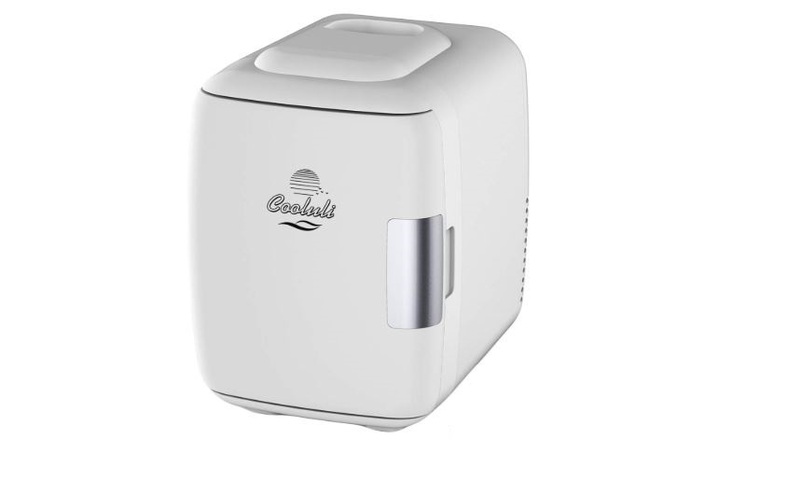 A small unit inside the cooler, smaller than a matchbox, transfers heat out of the cooler with the help of a small noiseless fan. It takes several hours to cool down your drinks, so there’s some trade off you have to make for the low-maintenance and low-energy cooling technology. It will not freeze anything you put inside. To get the best results, I recommend putting in already chilled cans. They will stay at 40 degrees below ambient temperature as long as the cooler is plugged in. You probably won’t use this feature often, but the Coooluli mini fridge can also warm up your drinks or food to a max 149 degrees. This is handy if you need to warm baby milk or a glass of water when you are off the grid. 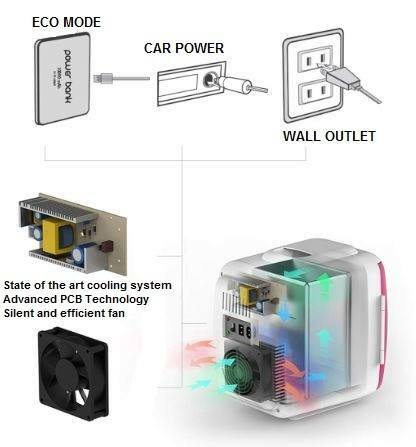 Most thermoelectric coolers come with only one power option – a 12V cord. The Cooluli cooler has three options. You can plug it into a USB port, a standard AC wall outlet or a 12V outlet. The best part is that they provide all the cables you need for the three options. No need to buy any cords separately. This versatility ensures you can cool your drinks no matter the situation. Going on a road trip or driving in your truck? Plug it into your car’s socket. Using it on your nightstand or in a dorm room? Connect it to an AC outlet. Going on a hike or camping trip? Plug it into the USB port on your power bank or solar charger. Note: When connected via USB, it operates at a lower-power ECO mode. You’ll notice reduced cooling performance. Most of the coolers I review are for road trips, camping and other outdoor adventures. But the Cooluli mini fridge is a jack of all trades. Because of its compact design and multiple power options, you can use it wherever you need to cool or warm something. Keeping beverages cold at work. It takes up little space on your office desk. In trucks, boats and RVs. 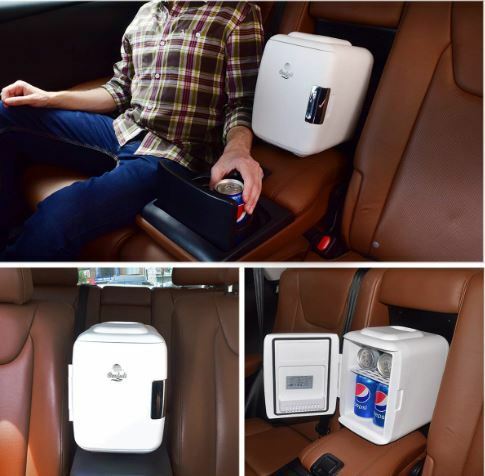 The Coooluli mini fridge is essentially a personal cooler that you can use anywhere. White too boring for you? Well, the cooler is also available in red, blue, fuchsia, white with black spots, pink and red. You can pick whatever color looks best on your office desk, nightstand or in your car. You are looking for a compact personal cooler for camping, picnics or fishing trips. You want a cooler to store your skin care products or medicine. You want a cooler/warmer to keep your lunch food cold or warm. You are looking for a large capacity cooler. The best place to buy this Mini Fridge Electric Cooler and Warmer is on Amazon, where you'll often find the best deal.